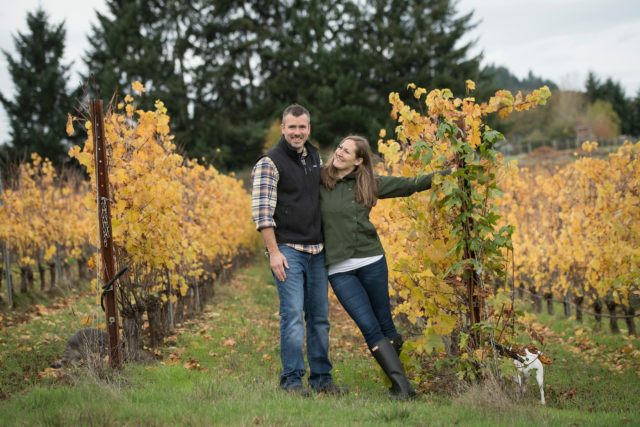 SALEM, Ore. – The year 2008 may be widely known for the significant economic downturn, but for husband-and-wife team of Erica Landon and Ken Pahlow it marked the launch of their dream in Oregon’s Willamette Valley: the formation of Walter Scott Wines. The name stems from Ken’s respected late grandfather Walter, and his adventurous nephew Scott, who lost his life too early. For Ken, it was an Anne Gros 1990 Richebourg (Vosne-Romanée, Cote de Nuits) he enjoyed years ago at Morton’s Bistro Northwest in Salem. 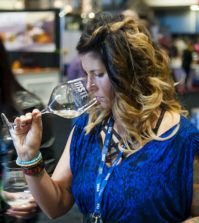 From their inspiration they formed a perfect partnership: Ken’s desire was to be immersed in production, marketing, and sales, and Erica fell in love with hospitality and service, sensory analysis, building wine programs, and achieving her sommelier certification. Walter Scott Wines’ first vintage of La Combe Verte Pinot Noir was produced in 2009. Two vintages later, they began making Chardonnay, a decision that has contributed significantly to their growing production and loyal group of followers. Total production across all varieties is now up to 7,000 cases per year. Their vineyard selections are thought out carefully, with fruit quality, location, terroir transparency, care of the land and relationships key factors. Both their Pinot Noir and Chardonnay have been featured at Oregon’s world-renowned International Pinot Noir Celebration and the Oregon Chardonnay Celebration. 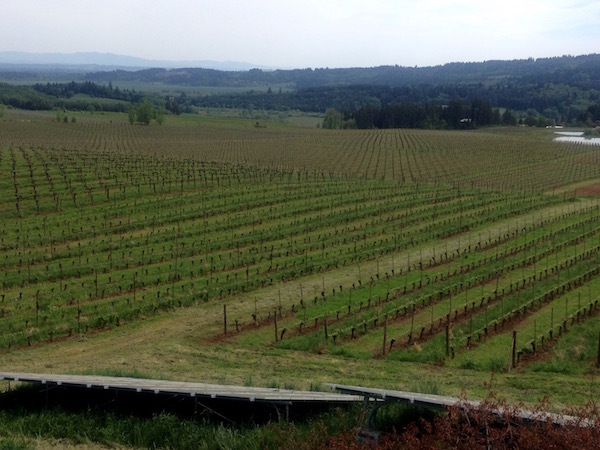 Erica shares that the biggest surprise in the Willamette Valley during the past 10 years is the staggering increase in both vineyard land and producers; it has essentially tripled since Walter Scott Wines was started. 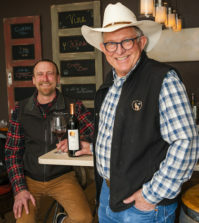 Their winery is situated at Justice Vineyard in the Eola-Amity Hills American Viticultural Area (a sub-appellation of the Willamette Valley AVA). Much of the fruit for their extraordinary Pinot Noir comes from this AVA, including Justice Vineyard (fruit farmed without herbicides, that Ken pursued for five years from Bethel Heights Vineyard owners Ted Casteel, Pat and Barbara Dudley), Seven Springs Vineyard (from 1984 plantings of own-rooted Pinot Noir vines, organically farmed vineyard of Rajat Parr and Sashi Mormon), Sojourner Vineyards (established by the Peseau family in 2007, farmed without herbicides), and Temperance Hill Vineyard (managed by Dai Crisp since 1999 and organically certified in 2013). 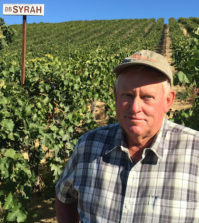 They also source fruit from the 88-acre Freedom Hill Vineyard, owned and planted by Dan and Helen Dusschee in 1982, which sits within the Willamette Valley AVA. This vineyard is within the recently proposed Mount Pisgah-Mistletoe Ridge AVA. Upon approval, this AVA would become the southernmost sub AVA of in the Willamette Valley. Their Chardonnay fruit comes from multiple vineyards across the Willamette Valley, including Freedom Hill Vineyard, Justice Vineyard, Sojourner Vineyard, Bunker Hill Vineyard and X Novo Vineyard, the later a mix of California heritage and Dijon clones planted in 2009 by Robin and Craig Williams of Napa Valley Cab fame. Each of the wines noted below that I had the opportunity to taste recently – their wines sell out quickly! – was impressive. I also appreciated the lack of cork taint in any bottle of Walter Scott Wines I’ve ever tasted over the years. That is likely due, in part if not completely, to their decision to use Diam corks exclusively. 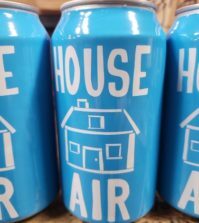 Erica shares that the consistency from bottle to bottle is amazing, and the lack of oxidative notes and cork taint is supremely important to them. Walter Scott Wines 2016 Freedom Hill Vineyard Pinot Noir, Willamette Valley, $55: The deeply fruited, violet-scented aroma is seductive. Bing cherry, black currant, forest floor, minerally notes, subtle oak, and a potpourri of spices weave through the irresistible palate. Supple tannins frame this well-structured wine, the acidity provides ideal balance to the intense fruit, and the long-lasting finish is heavenly. Walter Scott Wines 2016 Seven Springs Vineyard Pinot Noir, Eola-Amity Hills, $65: An intoxicating forest floor and cherry aroma wafts from the glass. Refined tannins and good tension shine on the palate, and the mouth feel is velvety smooth. Multifaceted with flavors of black cherry, anise, earthiness, sweet tobacco and spiced cranberry chutney flowing seamlessly onto the palate. The savory finish is long and mouthwatering; purity in a glass. Walter Scott Wines 2016 Sojourner Vineyard Pinot Noir, Eola-Amity Hills, $55: From rocky volcanic soils comes this sophisticated gem. Opening with beautiful florals followed by engaging layers of raspberry, cherry blossom, bay leaf, Rainier cherries, and a solid thread of minerality. Elegant and silky, with underlying oak (from 35% new French barrels) perfectly positioned in the background. Skillfully structured with firm tannins, and persistent length. Walter Scott Wines 2016 Clos des Olseaux Pinot Noir; Eola-Amity Hills, $55: The woodsy elements and forest fruits on the nose speak clearly of Pinot Noir; old world meets new world here. Boasting fine balance and good depth, flavors of wild mushrooms, dusty earth, Montmorency cherries, hints of black licorice, exotic spice, and blackberries unfold onto the palate. A fine backbone of tannins and underlying toasty oak wrap up the well-balanced package. 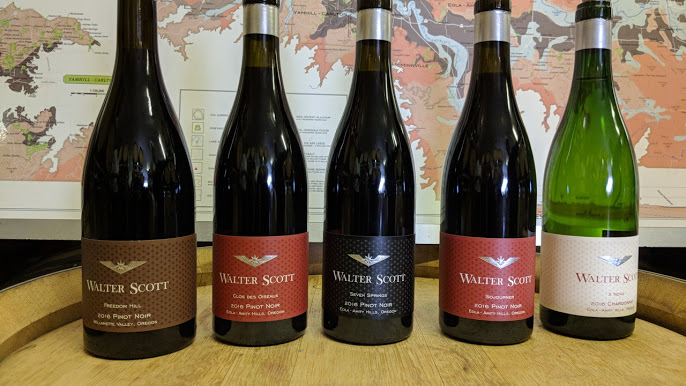 Based on my visit, and on the acclaim they’ve received to date in their impressive first decade of winemaking, I imagine one of Walter Scott Wines will be noted in years to come as an “ah hah” wine for a future vintner or wine luminary. For Riesling fanatics, certified sommelier Jess Pierce, Walter Scott Wines’s team member in charge of Oregon sales, marketing and education, has just released her first vintage wine, Pierce Wines 2017 Riesling. It is varietally spot-on, beautifully balanced, lively and refreshing. Refer to their website for further details, and news of current and upcoming releases.